A reflection of time spent working alongside ministries of faith in Honduras. It takes a day to live an experience. It takes 30-60 minutes to write about it. It takes you 3-5 minutes to read about it. It takes you even less time to forget about it. Even I will forget in time. I forget what I read. I forget what i wrote. I forget what I lived. But whether or not I remember, I am shaped. I am impacted. I am transformed. I would do well to duplicate the dandelion plant. One seed grows in the most difficult of places – even in the cracks of sidewalks – yet when the time is right, it has produced countless seeds. Those seeds grow into new dandelion plants, which produce more seeds, which produce more plants, and the cycle continues. It is much like the saying, “You can count the seeds in an apple, but you cannot count the apples within a seed.” What am I sowing? Pieces of me. That is all. But those pieces of me, blessed by God Almighty, can grow for the glory of the Kingdom. I have no idea of the impact that I had or can continue to have in Honduras. What comes from chopping down tall grass so that mosquitoes have less vegetation to inhabit at the orphanage? Or how can I tell what it will help that we improved the drainage from their laundry area and bath? Will someone want to do what I do because I shared with them in their classroom? Who is impacted by my testimony at the Bible study? Will the devotions that I shared with the team have any lasting impact? Or what about my day with Alexa (well, the rest of the third graders were there also) and her sister offering me the chance to keep in touch? What happens now that I told some of those in Honduras that I will return, even though I said “Adios” this time? Trust in The Lord in all your ways and lean not on your own understanding; in all your ways submit to him, and he will make your paths straight. (Proverbs 3:5,6) My understanding is so broken, so limited, so small. Because of the nature of my work with children, I did learn long ago that I will never truly know the impact of my work. I will never know if a particular word of advice was helpful or pivotal for someone who needed direction. Nor will I know what happens because of my failures, my mistakes, and my inadequacy. Thank goodness it’s not my plan. Better yet, thank God. In one of my earlier posts on Honduras I referenced the book The Grand Weaver by Ravi Zacharias. The book offers a perspective of a life well-lived and one that can look back upon the ways that God took some of the events that seemed to be the least significant and used them in mighty ways. We hear stories like that, like being the person that taught the person that taught the person who taught Billy Graham. How can you know at that point what God will choose to do with your actions, your words, your hands and feet? We cannot, but God does. God does us not ask us to understand, only to trust in all our ways. I’m getting better at that. Still not great, but better. According to life expectancy predictions, I have reached the approximate half-way point. That sounds like a somber reflection in some ways, but it does not have to be. I am enjoying it. I have started to be able to reflect upon the ways that God has used different experiences to bring me to the point that I am at now. God has used seasons of preparation to place me in this season of preparation for this time of sowing seeds. Whether dandelion or fruit tree, we are meant to bring forth seeds that will multiply life. That was God’s command in the beginning; it is God’s command now. As part of the way to bless the new mission house where we stayed, we were asked if we could bring down a sheet set and a blanket if possible. 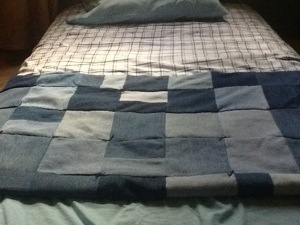 I chose to bring and leave a blue jean quilt made by my mother. I have no way of knowing if any of the patches came from jeans that I wore, but if I were to guess – knowing my mother’s resourcefulness – I would say it is pretty lucky. I thought it would be appropriate to leave “pieces of me” in Honduras, because that is exactly what I did. I left hugs, smiles, songs, words of encouragement, lights and – hopefully – Light. In exchange, I was given all of that back and more. That is the beautiful thing about God’s multiplication plan. God never asks for an equal exchange because we could never attain that. Instead, God simply asks that we leave what we have – our pieces, our seeds – and trust the creation of life to Him. *The title for this day came from an early-morning experience of picking up trash. Neighboring dogs had come on to the property of the home where we are staying and ripped open two bags of trash during the night. As I helped to pick it up, I happened to glance at the morning sky and saw a brilliant moon above the clouds. I had to point it out. It stood in such stark contrast to the task in front of us. The phrase “beauty from ashes” came back to me, and it framed my day. God never leaves anything lifeless, and there never is truly an end with God. In fact, out of those things which we call “endings,” God always creates beautiful beginnings. I do not typically receive well; I would much rather give. But when the giver is an eight-year old girl who speaks a different language and who has worked her way into my heart, I have no choice. As I have spent time in prayer this week, my perspective has been adjusted. It was not me, I have learned, who has been giving. But God, by the power of the Holy Spirit, has been pouring back into me. The people and children of Honduras have again received me in love. In other words, they have been giving to me all along. 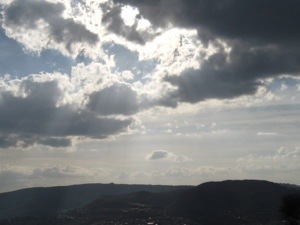 I truly believe that I saw the Holy Spirit clearly embodied and guiding me today. I am not an expert on the Holy Spirit by any means. In fact I grew up in an experience that left the Holy Spirit as an unknown member of the Trinity – a mystery – like the family member you have never met. As a result, I began my faith walk with much head knowledge but little sense of how I should navigate the moments of the day other than by rote obedience. And I know that the Spirit resides in us, but rarely have I experienced or seen it so clearly as I did today. The groundwork for today was laid during my flight out of Detroit. Once away from the noise, the to-do lists, the tasks, the pace of life, I heard the voice of the Holy Spirit speaking to me – from behind me. When I posed the question about the Spirit’s location, I was reminded that I often attempt to forge ahead in front of the Spirit. When I would be willing to allow the Spirit to lead, then I would hear the Spirit in front of me. *She offered me a piece of her gum, just as I had done for her the day before. *She assisted me as we were reading from the Gospel of John in Spanish. *She helped hold the cross as we made a lanyard craft together. *She offered me part of her snack, and then again, telling me that I could finish the second snack. *She made sure that I came off the bus when we stopped for the restrooms. *She held my water bottle for me. *She made sure that I put my camera back in the bag when I was finished. *She asked me if I was tired, and, when I said “A little,” she told me to go to sleep. *She held my hand on her shoulders when it was time for a group photo. *She held my hand as we entered the caves. *She grabbed on to me when she had fear inside of the cave. *She reminded me of the instruction not to touch the formations of the cave. *When we discovered that the wet railings left a bad smell on our hands, she would not let me touch the railing anymore and made me put my hand down by my side. *She brought my hand to feel her heartbeat inside the cave when it was beating fast from fear. *When I tried to sneak my phone out to record how precious her voice sounded inside the cave, she noticed it in my hand and offered to carry it for me. *She offered me part of the lunch she was sharing with her sister – it was delicious. *When playing a game that involves holding your partner’s hand, she brought me over to stand in the shade. *When we had played the game for a minute, she made me turn so that I was “all the way” in the shade. *She offered me the first choice of the lanyards we had made. *She asked me on the return trip if I was tired. When I said that I was, she told me to go to sleep. When I had been resting my head on the back of the bus seat for a few minutes, she told me to lift my head so that she could place her jacket underneath it. All of that, as just a part of the day, certainly points to a caring and loving eight-year old. But it was one moment inside of the cave that crystallized the experience of the Spirit for me. Alexa was certain to hold my hand the entire time we walked the 350 meters of the tour. In one narrow part of the cave’s path back outside, there was only room for one of us at a time. As we descended the dark, slippery steps of the cave, Alexa went forward and held her hand high as I followed behind her. It brought back to me the words of the Holy Spirit at the beginning of the trip, “When you are ready for me to lead, I will speak from in front of you. I will lead you.” That is exactly what happened with Alexa. I have often sensed the Spirit in ways that remind me of swimming. I cannot swim. But to “swim with the Spirit,” you need to let your feet leave the ground. You need to go with the current or you will fight against it. I have found so much beauty in water, especially in the last few years, and yet I cannot swim. But in many ways, I just did. Alexa, if you ever have the chance to read this, I did not understand so much of the words that you said. I understood everything that you did. Swimming with the Spirit is not a matter of knowing everything that is happening around you. In fact, if you are feeling quite certain of your surroundings and your place, you are probably standing still in the desert. But if your feet leave the ground, if you feel guided and cared for, if you feel love and safety, and closeness in spite of distance, you are probably swimming with the Spirit. Alexa’s sister, who attended the trip with us and led the students in songs, games, and crafts nearly the entire time, asked me if I wanted the phone number to be able to speak with Alexa. I will be glad to do that, but I would need significant work on my Spanish. The truth is, most of what I know about Alexa is from simply being around her. It is from everything she did and from her ever-present smile. I know about Alexa from her hugs (she asked how to say – in English – “I like hugs”) and her care for me – the one who expected to be the caregiver. The same is true of the Spirit. Even before you understand the language of the Spirit, you will know about the Spirit by just being present. Be with the Spirit. Learning how to swim will take time – your time, intentionally given. Today I asked in prayer that my ears would be open to understand Alexa. The answer given was “You will; you’ll see.” What I did not realize was that I was praying to understand the Spirit. And I will, with time. Make that your prayer today – to hear and to know the Spirit as your Comforter and Guide, your Counselor and Friend. Let the ending of yourself be a beautiful beginning to a new life with the Spirit. Beauty from ashes. I do not recall how the mention of the movie Finding Nemo entered the conversation on the bus ride out this morning, but I instantly jumped in – feet first. Strange that someone who cannot swim would jump in that way, but the movie is one of my favorites and my most-quoted film by far. Lines such as “Can’t hear ya, Peach!” and “Today’s the day! The sun is shining, the tank is clean, and we are gonna get out of here” find their way out of my mouth more often than I care to admit. One line in particular, as listed in the title of this piece, seemed to fit today: “Just keep swimming.” There is no particular measure of beginning nor end when you are on your fifth day in another country. The beginning seems so distant, the end seems so near, yet there is so much that will still be done. When there is much to be done, and when the continuity of relationships is uncertain, just keep swimming. It may not be right to say that I have “favorites,” because I have loved every one who has crossed my path, but I do. Alexa and Nancy have a special place in my heart, and they know it. My connection with them came to life because of my decision to “go swimming” during my first visit to Honduras. With nothing but free time remaining in the afternoon of a field day at a park, I ventured on to a playground without a translator to swim – to be with the children in spite of the language barrier. I understood enough of their communication to be able to swing on swings, slide on slides, and climb on monkey bars with them. Once you’ve done those things with someone, you have a friend for life. But what about now? Now that this trip has an end in sight, now that I have intentionally come back not just for them, but for them nonetheless. I keep swimming. I knew that I would probably see Nancy for the last time – on this trip – today. Lord willing, I will have time with Alexa and the rest of the third graders tomorrow during an all-day field trip to the caves. I am not a big fan of “good-bye,” so how do I navigate the waters? I swim. When Jesus knew that his work was coming to a close, he kept “swimming.” John 16:31 tells us that Jesus exclaimed, “You believe at last!” His arrest was around the corner. His death was drawing nigh. But Jesus did not stop, and neither should we. What is “swimming” in this analogy? Well, what was the point of the line in the movie? The line in the movie became a mantra of forward movement to find what they were seeking, a chant to say in the darkness as they searched for the light. Isn’t that what Jesus did? Did Jesus not say that he is the light of the world? He also said this: “As long as it is day, we must do the work of him who sent me. Night is coming, when no one can work. While I am in the world, I am the light of the world.” (John 9:4,5) Jesus desires that we keep swimming – that we press through the darkness, by the guidance of the Holy Spirit, in search of the light. Even when Jesus knew that a time of darkness was coming, he pressed on. He prayed. Jesus prayed for himself, praying that the work of God in Jesus would bring glory to the Father. Jesus then prayed for those closest to him – his disciples. He prayed for the disciples to be one. He did not pray for them to be “as one” or “like one,” but that they would be one. That same request for unity appears in Jesus’ final petition to the Father when he prayed for all believers: “that all of them may be one” (John 17:21a). Jesus knew his time was coming, but it was still day. While it is still day, we must work. I started to sense the difficulty of having to leave soon when Alexa gave me the first hug of the day. She did not let go. She did not have to, but I knew she knew. While we were sharing in her classroom, I caught her looking at me often. I did what I could; I gave her a smile. I was around Nancy often today. 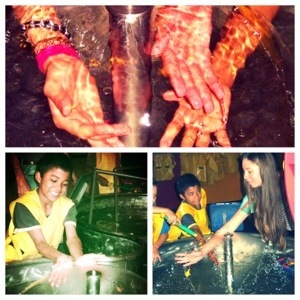 We played “rock-paper-scissors” and “over-under” in the games. Nancy is feisty – she will not be pushed around. But even in that moment a quick look and a smile can change her expression. As the students prepared for lunch, Nancy was asking me a question that I did not understand. When I could not answer, she found another person to give her the answer. She wanted to know if we were about to leave. Yes, we were, and that made her sad. Keep swimming. This afternoon we spent time with a group of students who participate in a tutoring program in another community. I had not met them before and we were going with them to a children’s museum. I found myself internally questioning what could I possibly gain from such a short time with students I had not met? Just keep swimming. The eight students were prompted to introduce themselves in English. One of the boys, Daniel, had his right eye damaged in an accident when he was only one year old and can no longer see from that eye. As has been the case more and more, I already “knew” that he would sit by me on the bus. The students went on the bus first, and I went to the seat where I had left my belongings. It was with Daniel. Although the students were encouraged to speak in English, Daniel and I communicated in English. Later I learned that Daniel does not like to talk to people because of his eye, but he was freely sharing with me. I learned a lot about Daniel, and especially took note of the fact that he likes to write, including poems. God helped me see the light because I kept swimming. But the power to swim came not from me, but is only by the power of the Holy Spirit going before me – removing the resistance that would impede me. Because of this, on a day where I sensed the darkness of an impending “good-bye,” I found the light of a new relationship. 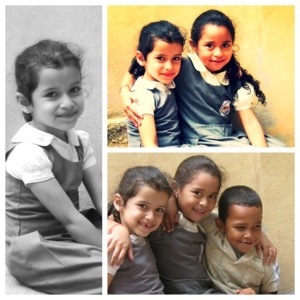 This return trip to Honduras reminds me of how little I have to offer. In my first trip, I had already understood that I would never know – on this side of heaven – the impact of stepping into the lives of those I would encounter. Now that I have chosen to intentionally step back into their lives – now what? What can I do? There are still hungry (spiritually as well as physically) people all over the world; how can I help with that? The children that I have met still have much less access to resources than me or my neighbors. 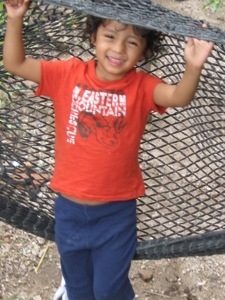 The children at the orphanage still often wear improperly fitting shoes and sleep in beds that we would never rest in. The children at the school still must go home where there is the possibility that their father or mother could be taken away by violence. So what can I do in such a short time? The fact that I was quickly remembered by many of the students and teachers at Jubilee Center International made me question my purpose all the more. These children are loved, yet need so much. The people of the community of La Era still struggle with significant unemployment. The nation of Honduras remains dubbed “the most violent country in the world.” So what can I do? I know in my heart that I do not plan to return to Honduras this year. So now I will be saying “Adios” to the children rather than “Hasta pronto” (See you soon); so what can I give while I am here? Can I make a transformational impact in just a few short days? Is that even why I am here? Am I here for them, or am I here for me? Or am I here for God? What can I give? I can give the same thing that the disciples gave when Jesus saw the great need of the masses; I can give all that I have. I can take photos of Nancy who is quick to invite other friends into the picture. I can ask Alexa how she is doing and how she received a scrape on her arm. I can tell Jose, who does not speak, that I like his picture when he shows it to me. I can grab Band-Aids for the girl who scraped her hands and knees during a game. I can ask Deisi if she is alright when I see that she is crying. I can laugh when the boy offers me advice on how to be a better soccer goalie. I can give hugs – and receive them. There are a number of layers to the story of the 5,000 being fed. Jesus gave thanks and blessed what was available. The disciples doubted how they could feed the hungry, but they obeyed Jesus anyway. And then there are those who received. Mark 6:42 tells us “They all ate and were satisfied.” We don’t often give attention to the crowd in our reading of this story, but it bears examination. The people ate and were satisfied. When Jesus blessed what was given to them, they were satisfied. Does it tell us that the crowd was never hungry again? No. Does it tell us that the crowd was never lacking for food again? No. But in that moment, they were satisfied. Their need was met, blessed by Jesus. Alexa and Nancy, the sweethearts who pulled me around the playground during my first visit, gave me many smiles and hugs today. Recognizing the language barrier, they would sometimes just look and smile. They were satisfied. Satisfied because I have chosen to offer all that I have in obedience to Christ’s command. And not only have I offered it but Jesus has blessed it. They have not asked me to take them home, even though my heart knows that I would. They have not asked me to make the problems go away. They have not asked me to “fix” Honduras or the world. They are satisfied to receive the love and attention that I am willing to give them because it is given in obedience and blessed by the presence of Jesus. In return, my faith is strengthened in the knowledge that God can do more than I ever imagined. That is enough for today. Tomorrow will bring another opportunity to serve, to receive, and for the work to be blessed. The disciples witnessed the miraculous blessing of Jesus feeding the hungry, but that was not the last time they would need him. We always need him. That very night, after the feeding of 5,000, Jesus found the disciples straining at the oars of a boat in the middle of a storm. Jesus once again stepped in, walking on water, and calmed the storm. That assures me. I was prompted to come to Honduras initially and it was truly evident that the obedience was blessed beyond expectation. 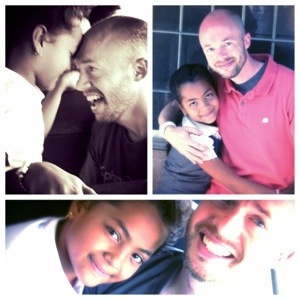 Returning to Honduras is also an act of obedience, and again it has been blessed beyond measure. Why? Because Jesus, the very Bread of Life, shows up to feed those who are hungry for him. Jesus, the one who calms the storm, shows up to bring peace. It is the work that Christ does that meets the need. He is the Bread of Life and the Living Water. What else could I need? You might not recognize the words, but you would probably recognize the tune if you heard it. You might sing it as, “I am a friend of God.” Today in Honduras, in the city of La Era, there was a birth of worship. Hondurans and Americans gathered together to worship and praise God. They gathered together to break down barriers through hugs and blessings. They gathered together to sing in Spanish and English, declaring that God is our faithful friend. Indeed. There is much that keeps us apart, especially on Sunday mornings. When I say “us,” I am referring to God’s children. I am referring to you. I am referring to me. Worship styles, people who look like us, language, comfort levels – all are factors that serve more to divide than to unite. Now how is it that those things given to us by God, for God, can keep us from God? Perhaps they keep us from God when we decide that they are not for God. When a worship style becomes for us, it is no longer for God. When our comfort level is important, it is no longer for God. You know who gets this right? The ones who get this right, this worship without motives, is children. That was also evident today. 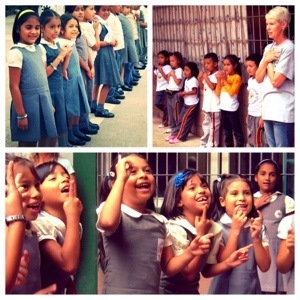 When a song is placed before them, no matter the language, children will sing. Children will hug. Children see differently than us. It can be uncomfortable to be in a worship experience unlike your “normal” experience. It can be uncomfortable, but it can be good. It is good. You could use the excuse of saying, “I’ve never done this before.” But guess what? No one else has either. Worship is a dynamic experience. It is not like your favorite movie that you have seen six times and can quote the lines. At least it shouldn’t be. So when you gather with others to worship, you are entering a new experience which means that it should not have a predictable outcome. To worship God is to pour out your heart and to enter into God’s. This mystery of God living in us and us living in God is rarely more wonderful than when we intentionally gather together in worship. And what then, can be more wonderful than to seek to press deeper into the heart of God? How do we do that? By living out, intentionally, this act of reconciliation. We sing songs of praise, of worship, of confession, of adoration, to be more fully reconciled to God. We greet one another in love, as Brothers and Sisters in Christ, to be more fully reconciled to each other. We listen to the truth of God’s word to allow for deep, transformational impact to come alive inside of us. So let me ask you, how are you doing with that? As the team reflected upon the day, most commented on the beauty of worshipping together in Spanish and in English. Person after person was struck by the warmth that could take place in greeting one another, though most of us had never met before. Still others commented on the sincerity of worship within everyone else. Where else could you find that but in worship? The first answer that comes to mind for my own question is a sporting event. People who do not know each other can gather together, greet each other, and share an experience with another person who was a stranger just hours before. The question is not whether or not we worship, the question is who receives our worship. A good friend of mine points out that worship is happening everywhere. My good friend is right. Whether it is the musician, the athlete, the political figure, the actor, or the material possession we wish to have; worship is happening everywhere. No wonder we are divided. We have fallen in love with the created rather than the Creator. We have fallen in love with what we can hold rather than what we can never grasp. We have fallen in love with what we can earn rather than what we cannot afford. We have fallen in love with ourselves. Again we must look to children as our example. Children understand receiving. Children understand dependence. Children understand comfort in a way that we, as adults have long since forgotten. Comfort is not about what we can control, but it is all about knowing who is in control. When I step into apparent discomfort in my worship, I allow for God, through the Holy Spirit, to surround me with peace, with love, with comfort. The comfort of knowing that I am not my own. The comfort in knowing that God will provide for me when I trust in him. The comfort of knowing that I not only have a faithful friend, but an Almighty God. An Almighty God worthy of worship in any language. Yesterday, to the best of my knowledge, there was a wedding reception in the barn on my parents’ property. No one from the family, just a couple that wanted to celebrate in that setting. The plan for this reception had been set in place for months, and the work of preparation took place in earnest once the warmer weather of Spring appeared. I learn a lot about myself when I learn about my parents, and this experience of barn preparation was one of those moments of insight. At one point I was talking to my mother on the phone and I had asked about the barn. She started to tell me, “You know those windows over the barn doors?” “Yes,” I responded. “Well Dad is up on the ladder…” “cleaning off the bird poop,” I said as I finished her sentence. I know my father a little too well in that regard. What’s the point? The reception would take place inside the barn, and the odds of a guest looking up to say “What nice, clean windows” are a million to one. But the thanks is not the point. It never is with my father or my mother. They do the work well because they believe in doing the work well. That is something they learned from their parents, and that is something they have passed on to their own children. There is an expression of love in doing the work well. Scraping off bird poop is an expression of love? Absolutely. This is what I believe about my father and my mother: if they recognize something that could be done in service to someone and they do not do it, they would feel selfish. And they recognize a lot of needs. I believe that about my parents because I experience it myself. If I see something that can be done and I do not do it, I feel restless. This is not to say that I always do everything that I see, because I don’t. But then I live with the restlessness. Doing the work that God has called you to do can sometimes be thankless. In fact, it very often is. And if you were hoping to be called to a “glorious” ministry position and you want to wait until that opportunity arrives, you might miss the point altogether. On our second day in Honduras, I had the opportunity to return to the San Jose Orphanage in La Paz. Sister Edith again greeted us with a smile, toddler in her arms, surrounded by 14 others, in front of a courtyard full of washed and drying laundry. Edith had stepped out of a “glorious” ministry position of teaching children in a privileged area because she believed God wanted more from her. She returned to her parents’ home. She prayed. She waited. One day a woman dropped off two children at Edith’s door, asking Edith to care for them. She did. More than 10 years later, she cares for 15 children – in an abandoned high school building. I don’t know whether or not Edith ever asked herself the question, “What’s the point?” Whether she did or did not is between her and God. All I know is that Edith has been faithful in her obedience and God has been faithful to her. Among the tasks we were called to do while we were there was to chip away and remove cement from a drain for the laundry and shower. Tall grasses were chopped down with machetes. Piles of stones and dirt were moved from one open “room” to the surface of the playground. And I’ll admit, when I got my first taste of flying drainage water and cement in my mouth and eyes, I wondered, “What’s the point?” When I started sweating buckets to move stone and dirt via wheelbarrow, I wondered, “What’s the point?” Then I remembered the verses I read in the morning, Romans 12:1-2. I noticed the familiar command to offer our bodies as living sacrifices, but then I noticed that this was called a “spiritual act of worship” (emphasis added). Offering our bodies is a spiritual act? Why is it not a physical act of worship? Edith embodies that extremely well. She recognized that the love God has for her was immeasurable. She knew that God had called her to do more than to love those who were already receiving love. She did not even know what it was that God had in store for her, but God knew. God knew exactly what Edith could do and what could be done through her. She began to care for and love on children with no regular income. She wiped noses, cooked meals, hugged, sang songs of love, and remained faithful. Because God had loved her first, she felt compelled to love others in the manner that God had called her. Edith was given an opportunity to live out the love she had been given. Can you imagine not being able to express the love that has been given to you? That is the point. In scraping bird poop off windows, in cutting down grasses that will grow again, in moving a small portion of the large pile of sand and stones, we are given an opportunity to express love. Our bodies perform spiritual acts of worship. When Edith washes a child’s messy face, folds the laundry for the 50th time, or sleeps with a sick child – she worships. We have to change our view of what is “glorious” work. We have to shift the perspective of who receives the glory. And once we realize that it is not us, we can offer our bodies in spiritual acts of worship so that God, correctly, receives the glory. I remember sharing with a friend that I did not think the “old me” would be coming back from Honduras. I had no idea how accurate that was. The last four, nearly five, months have been an interesting adventure. Interesting in that I stepped away from a full-time position and maintained only a part-time position where I presently work. I had no other plank in the bridge to step on, only faith. And surprisingly, I had peace. I am not one for high-risk adventures. If you know me at all, you know that well. I prefer my risks to be calculated, thank you. But this time I did a different calculation and started drawing upon the reservoirs of grace and provision that God makes available. Far too often, we find it strangely comforting to be self-reliant. Our pride and sense of accomplishment draws us in like inviting ocean waters. So, pride in hand, we swim out to say, “Look how far I have come!” No sooner do we raise our hand in exclamation than the powerful riptide of pride pulls us under. I know that has happened to me. If it has not happened to you, it will. One thing that I had to let go of was my grasp of a title. When I stepped away from the full-time role, I was left with only one title, that of chaplain. As I applied for and didn’t receive positions that I felt qualified to fill, an interesting thought dawned on me. Four of the last five positions, or titles, that I have held have been positions that I was directly asked to seek. There was only one that I applied for and received without being asked – the ministry role. “Oh!” I exclaimed in awareness, “You’ve been making this clear all along.” I just was not looking. It has taken me time to accept the role that I hold. In my second interview for the position, I shoved off the possibility that kids might call me “pastor.” In the form of Moses, I gave a “surely-not-me” type of response. But then the kids did start to call me that, as did the staff. What’s going on here? But I continued to do the work, and I held firmly to this place where God had brought me. I knew that he had placed me there for a reason, and to leave it would only bring me frustration. About two weeks before I left for Honduras, I was finally able to tell my supervisor that I see myself as a pastor now, a pastor without a building. Whether by “pastor” or “minister,” I humbly accept this calling upon my life. There is a reason that I was born into a Christian family. There is a reason that my parents sacrificed to give me a Christian education. There is a reason I have felt called to serve others. There is a reason that God has allowed me to have the experiences that I have had, and that is to stop, turn around, and pour back out all of the love that has been given to me. When I first traveled abroad it was to Nicaragua. I came back excited about what I had been able to experience. That was in 2009. I had paid it little mind until recently. There was something about the mention of a trip to Honduras that grabbed my attention. And, at the same time that I was stepping away from a title, I was stepping forward in faith that God wanted me to go to Honduras. What I did not see, however, was just how strong the pull would be for me to return. I have not been an especially pleasant person this week. I have been irritable, frustrated, tired, and grumpy. (And yes, mom, I am eating and taking naps.) The problem lies in my “now what?” How do I mesh my experience in Honduras with my experience here? People have differing perspectives on mission trips. Some will say, “Why would you spend money to go there when there is so much need here?” I hear you, but I don’t believe that the view has to be mutually exclusive. Going abroad and serving at home are mutually beneficial, not mutually exclusive. Everything that I have learned here, in ministry, work, and education, helped me to be the person that I was when I was in Honduras. Everything that I learned in Honduras and in Nicaragua helps me to be the person that serves here in Grand Rapids. One shapes the other, but you cannot shape the one without the other. The truth is that my home is not here in Grand Rapids. I have never felt that. But the truth is that neither is my home in Honduras. This world is not our home, right? So if my home is in heaven, the place that God is preparing for me, what am I to do here? Love God and love people. Going abroad reminds us of the universal truth of human brokenness. And it is also true that, universally, people need grace. And people give grace. In my two weeks abroad, I would venture to say that I gave and received more hugs than in all of the length of time in-between. Why? Partly due to culture and partly due to a recognized common love for the Lord. There is brokenness here too, and a need for grace. Unfortunately the culture in which I am living has become very good at covering it up. We sell artificial grace, things that will make it seem like we are not broken. But, at the end of the day, we always have to take off our artificial grace. We are exposed. It is tiring. Wearisome. And unnecessary. There is no grace substitute, and it would serve us well to stop searching. And there is no right nor wrong place to serve the Lord. We must serve where we are. One of the genuine difficulties for me this week was in leaving Honduras. It felt more like home than home. But God also reminded me that I am not ready for that step. Some day, Lord willing, I will be. But I cannot fast forward his plan for me. There is love to give here. Grace to give here. And grace to receive, much grace to receive, before the next place comes. The only time that Jesus really began to speak about his future plans was when he knew his time had arrived. And even then, the disciples began to doubt and question. We do not need to see around the bend. We only need to see the road and the One who walks with us. When we see what is around the bend, it will make perfect sense. But, if we saw it now, we probably wouldn’t believe it anyway. What if Friday Wasn’t Good?